No one denies that people can have difficult problems in their lives, that at times they can be mentally unstable. Mental health care is therefore both valid and necessary. However, the emphasis must be on workable mental healing methods that improve and strengthen individuals and thereby society by restoring people to personal strength, ability, competence, confidence, stability, responsibility and spiritual well-being. Although CCHR does not condone or promote any specific practitioner, medical organization, practice or group, we have found the resources here to be helpful for individuals looking for more information about alternatives to psychiatry. CCHR does not provide medical advice. However, you might wish to review this document about non-psychiatric alternatives: Complementary and Alternative Medical Therapies for ADHD. CCHR recommends a full, searching medical examination by a non-psychiatric health care professional, with appropriate clinical tests, to determine if there are undetected and untreated medical conditions that could be causing or contributing to mental distress. Download this document to read about how this can occur: California Medical Evaluation Field Manual. 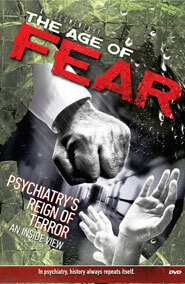 The more money the psychiatric industry gets, the more fraud and abuse we get. 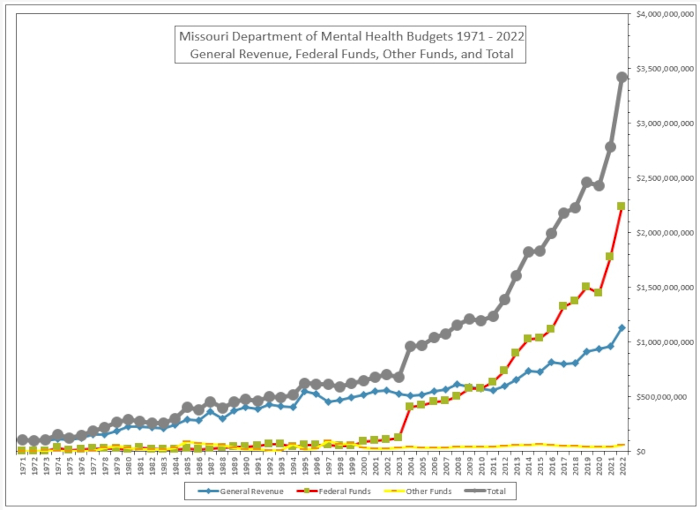 Notice how much the Missouri Department of Mental Health budget keeps jumping up! Did you think this was going to go down without your help? People in desperate circumstances must be provided proper and effective medical care. Medical, not psychiatric, attention, good nutrition, a healthy, safe environment and activity that promotes confidence will do far more than the brutality of psychiatry’s drug treatments. Housing and work will do more for the homeless than the life-debilitating effects of psychiatric drugs and other psychiatric treatments that destroy responsibility. The use of physical and mechanical restraints should be outlawed. Until this occurs, any psychiatric staff member — and the psychiatrist who authorized the procedure — should be criminally culpable should the restraint result in physical damage or death. Insist the community treatment laws that rely upon mandatory and thereby coercive measures be abolished, and dismantle or prevent “mental health courts” which are another conduit for drugging our communities. Humane mental health hospitals and homes must be established to replace coercive psychiatric institutions. These must have a full complement of competent physical (non-psychiatric) doctors and medical diagnostic equipment, which non-psychiatric medical doctors can use to thoroughly examine and test for all underlying physical problems that may be manifesting as disturbed behavior. Government and private funds should be channeled into this rather than abusive psychiatric institutions and programs that have proven not to work. Legal protections should be put in place to ensure that psychiatrists and psychologists are prohibited from violating the right of every person to exercise all civil, political, economic, social and cultural rights as recognized in the Universal Declaration of Human Rights, the International Covenant on Civil and Political Rights and in other relevant instruments. Appropriate state regulatory agencies should investigate every complaint of psychiatric assault, fraud or illicit drug selling. Such agencies should revoke or suspend a psychiatrist’s or psychologist’s license for such criminal practices. All patient complaints of sexual abuse should be referred to the police, attorney general or prosecutor who are obligated to investigate and prosecute. 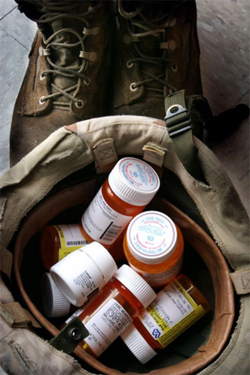 The responsible officials of regulatory agencies or their advisors must be held accountable and criminally charged for harm caused by psychiatric drugs and other psychiatric “treatment” if it is established that they knew, or should have known, of such harm either through clinical trial results, adverse reaction reports or broadly available public information. Establish rights for patients and their insurance companies to receive refunds for mental health treatment which did not achieve the promised result or improvement, or which resulted in proven harm to the individual, thereby ensuring that responsibility lies with the individual practitioner and psychiatric facility rather than the government or its agencies. Clinical and financial audits must be done of all government-run and private psychiatric facilities that receive government subsidies or insurance payments to ensure accountability, and the compilation of statistics on admissions, treatment and deaths, without breaching patient confidentiality. Establish or increase the number of psychiatric fraud investigation units to recover funds that are embezzled in the mental health system. Taxpayers’ money must not be used to fund psychiatry’s unworkable methods and “treatment” for “diseases” that cannot be scientifically verified. It must be recognized that every person is responsible for his or her own actions and must be held accountable for their actions. State legislators should repeal any laws permitting the insanity defense and diminished capacity pleas. Remove psychiatrists and psychologists as advisors or as counselors from courts, police forces, prisons, criminal rehabilitation and parole services, and educational institutions. Because psychiatrists have no scientific foundation for their claims, do not permit them to render opinions about or to treat drug addiction, criminal behavior and delinquency, or to probe for alleged dangerous behavior. None of the 374 mental disorders in the Diagnostic and Statistical Manual of Mental Disorders (DSM IV) (or those in the International Classifications of Diseases mental disorders section) should be eligible for insurance coverage because they have no scientific, physical validation.